This is another fine product from the DA Bomb brand name. 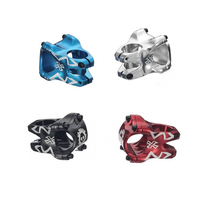 The DA Bomb F35 45mm AM/FR Alloy Stem has been made from 6061-T6 Alloy, that has been skillfully CNC machined to produce this fine looking product. The F35 brings life to your bike with its unique V- shaped design, that holds your 35mm diameter handlebars firmly in place.